This course has been approved for 40 hours of certification/re-certification training credit by each of the following boards: IAI Crime Scene Certification Board, IAI Tenprint Fingerprint Certification Board, and IAI Forensic Video Certification Board. The initial response to the crime scene and its investigation will often dictate whether or not the crime being investigated will be solved. The Crime Scene Investigation course on the response to and processing of crime scenes will prepare the student to improve his or her skills in documenting scenes, identifying, processing, and collecting evidence from the scenes, and will begin to prepare them to testify as to their findings. The course is intended for basic to intermediate-level investigators and technicians who have limited on-the-job experience. 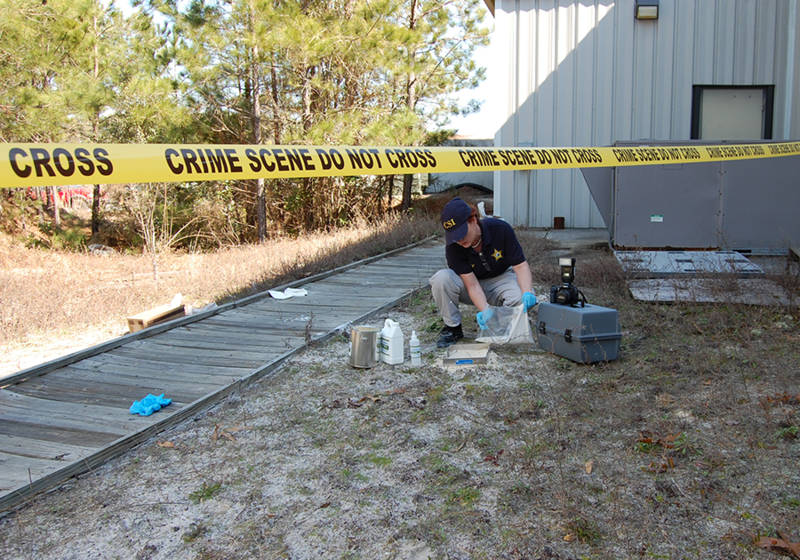 New personnel, those who do not investigate crime scenes on a full-time basis, and those currently working in the field of crime scene investigations for less than two years will benefit most from this course. Topics will be presented in a lecture format that will be immediately followed by hands-on exercises that reinforce the learning of material presented in the lectures. The first block of instruction will be related to photography with a concentration on the relationship between ISO, Aperture and Shutter Speed. There is a great deal of hands on during the week that will be accomplished through the use of photography. An understanding of these relationships is beneficial for not only these exercises, but will also benefit the student when he or she returns to work. The remainder of the first day will cover documenting the crime scene. Stress will be placed on how to take a methodical approach to make sure that the most positive results will be obtained by the end of the investigation. The students will be required to draw a detailed diagram of a mock crime scene. The second day will be spent on processing evidence and proper packaging methods. The lectures will be reinforced through the use of hands-on exercises. The first half of this day is devoted to the processing, documentation, and collection of blood evidence at crime scenes. The entire day is spent on the documentation of footwear evidence. The final day of the course begins with an introduction to testifying in court and the course concludes with a demonstration of how the proper use of Photoshop can enhance evidence collected from the scene. Booking Info: Call the hotel and mention the Crime Scene Investigations course to receive the special rate. Special rate expires 04/24/19.